You can even restore your contacts to a particular point in the past. Restore Contacts option lets you to choose the time you would like to revert your contact list to. You have the option to select – 10 minutes, 1 hour, yesterday, 1 week, Custom time and upto 30 days in the past. 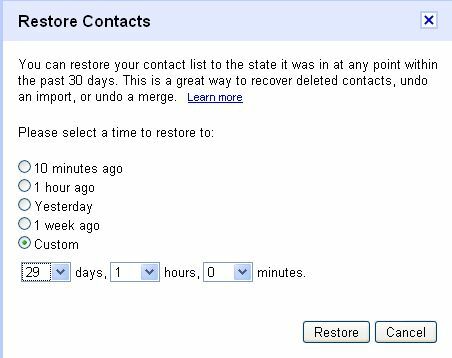 Go to Gmail’s Contacts Manager, select “Restore contacts” in the “More actions” menu, and choose the time you would like to revert to. You can even undo a restore operation. Once the restore operation completes, a notification appears that gives you the opportunity to immediately undo the restore contacts operation. Visit Gmail Managing Contacts Help section for more.